On March 11, 1964, Gene Roddenberry wrote “Star Trek is…” onto a blank piece of paper. Fifty years plus later, the fan-favourite show continues to intrigue and innovative audiences the world over, and now with the excellent Star Trek Discovery reigniting our love for the sci-fi series, never have our expectations been higher… nor our craving for all things Trek greater. With Discovery returning to our screens this week after it's mid-season break, I've ranked my favourite 23 episodes. Sure, some tough decisions had to be made (and of course, there have been some absolute stinkers that had no chance of making the shortlist! ), but given the rich plots and stories from across fifty years of television, there's certainly plenty to choose from. No doubt there will be lots of 'discussion' about which episodes did and didn't make it in, so let me know your favourites in the comments below. Family is a defiantly low-key, but quietly radical, Star Trek story. Set in the aftermath of The Best of Both Worlds - which saw Picard forcibly transformed into one of the Borg - our favourite Earl Grey-loving captain returns to his ancestral home and comes to blows with his surly brother. Boring? Not a bit of it. This is Trek as a character drama, and an intelligent one at that. It's lack of plot only serves to emphasize how attached we have become to Jean Luc over the last few years, and how traumatised he has been by his recent fight. Enterprise struggled to find its identity over the years. It had some great episodes and a lot of confused fluff, but there's no denying the confidence and strut of its pilot. Broken Bow sees the launching of the first Warp 5 spaceship and the Enterprise NX-01, and therefore the true beginnings of Starfleet. Captain Archer and his crew must take an injured Klingon back to Kronos, but get drawn into a mysterious time war that would go on to become an essential (if poorly wrapped-up) element of the series. Lampooned in the years that followed, this is the famous "hippy" episode, where Spock comes under the influence of some local spores and falls in love with lovely Leila. Here's the thing, though; there's loads more to this episode than just the sight of Leonard Nimoy playing a very different sort of Spock and a drug metaphor. The love story is sensitively handled, and it's conclusion very affecting. There's some great dialogue (McCoy bellowing "Hiya, Jimmy boy! I've taken care of everything. All y'all gotta do is relax!" is a treat) and writer DC Fontana hones in on Spock's loneliness when he returns to "normal". And what could be more perfectly '60s than Star Trek meeting flower power? It's safe to say that Voyager doesn't have the best rep among fans. New Star Trek had become such a part of the TV furniture by then that the shock of the new had worn off, and the franchise was badly in need of new ideas. That's not to say that there weren't good episodes, however, including the excellent pilot. Caretaker quickly sets up an intriguing status quo where Starfleet loyalists and a faction of rebel colonists called The Maquis are forced to work together when they find themselves trapped on the other side of the galaxy. Kate Mulgrew impresses as Captain Janeway, and the ship's medical hologram, played by Robert Picardo, is hilarious. Harry Mudd returns in this celebrated episode, using a crystal to lock the USS Discovery crew in time as they slip on their party clothes to unwind a little. 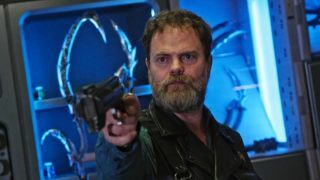 In his efforts to keep the crew occupied as he explores the starship, looking for secrets and details to sell to the Klingons, Mudd's time crystal dooms the crew to die over and over, until Stamets - who exists outside of the loop - can convince Burnham of Mudd's plans and put a stop to them. It's a perfect, self-contained episode that explores not just time loops, but broader themes of love, loss, and greed. It also forever locks The Bee Gees as Trek canon. This one lives up to its name. This season four two-parter focusses on the Voyager as it is caught up in a running battle with the Krenim race. Over the course of months we begin to see the ship worn down, and its crew put through a string of disasters. It's almost - almost - Voyager's equivalent of The Best of Both Worlds with its dark tone and high consequences. Alas, it hits the reset button at the end of the story. AKA the one where Kirk is forced to wrestle a lizard. Arena is a truly iconic episode, homaged on Wayne's World and even JJ Abrams' 2009 Star Trek reboot. Vasquez Rocks in California are a stunning backdrop, a world away from the show's studio sets, and the Gorn captain is a fantastic adversary. What really makes it classic Trek however is the resolution, which relies on compassion and mercy, rather than brute force. Wrapping up a series as beloved as The Next Generation is a seriously tall order, but All Good Things... manages it with aplomb. It cleverly ties back to the very first episode, with John de Lancie's Q presenting the crew with another puzzle to solve, this time one that takes place in multiple time zones. The episode has an appropriate sense of closure, but with the movie series ahead of the Next Gen crew, this wasn't so much a goodbye as as a graduation. The first series not to pivot the story around the captain, all eyes were on newbie Discovery and its opening episode, and it did not disappoint. Occurring a decade before the events of the original series, The Vulcan Hello introduced us to First Officer Michael Burnham - a human raised in a Vulcan world - and the Federation-Klingon Cold War. It showed us that Burnham's upbringing had afforded her with an unique insight... and she was not against bending the rules and going against orders for the greater good. It was beautifully followed up by its sequel, Battle at the Binary Stars. Designed to celebrate Star Trek's 30 anniversary, this glorious episode steps away from Deep Space Nine's traditional gloom and doom by flinging the cast back in time and into the original series episode The Trouble With Tribbles. The modern day cast appear to interact with the original icons in a hilarious, nostalgic, and brilliantly realised tribute to the show's origins. Okay, so it's technically not the real pilot (that's actually The Cage which was rejected by NBC), but it marks Kirk's first appearance, and therefore the start of Star Trek as we know it. The Enterprise encounters the SS Valiant, a starship lost 200 years previously. Kirk's friend Gary Mitchell and the ship's psychiatrist, Dr. Elizabeth Dehner, are rendered unconscious as they fly through a magnetic storm. But when they awake, begin to demonstrate peculiar psychic powers. It looks a bit ropier than the main show and not all of the regular cast are in place yet, but it does show just how much of Star Trek was in place right from the start.